Archetypes: Journey to Self (2010). Three-level boxed set of thirteen books. Book cloth, binders board, washi, pigment ink, mylar, thread, garnet dust, nickel, glue. 6 x 6 x 6 inches closed. Boxes are a metaphor for rich and layered psychological space. Through the lens of Jungian archetypes, personal stories and memory, this collection of artist books explores what lies beneath our conscious awareness – both light and dark. In Case of Panic (2010). Book cloth, binders board, paper, pigment ink, nickel, glue. This artist book documents my response to thwart a panic attack while driving over the Chesapeake Bay Bridge. Edition of 15. Moving Parts (2010). 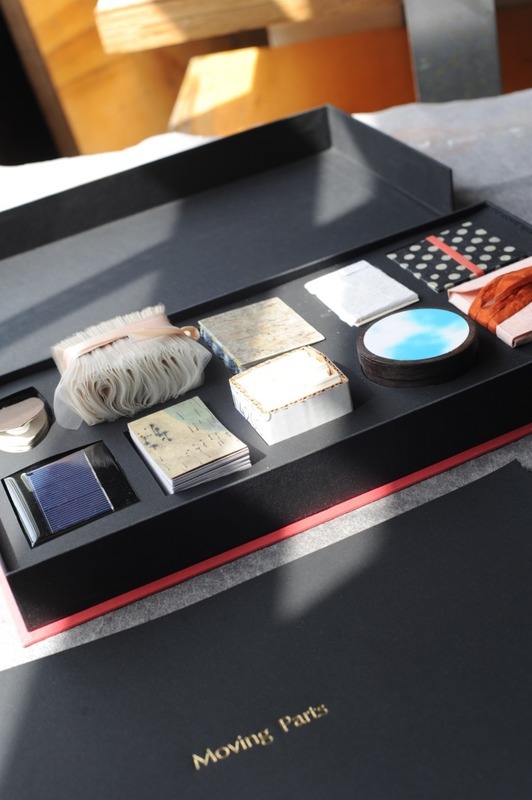 Boxed set of ten artist books. 9 x 18 x 3 inches closed. Moving Parts is a fund raising project in collaboration with Pyramid Atlantic Art Center and CityDance Ensemble. The project involved ten book artists, each interpreting an aspect or theme from CityDance's performance season. 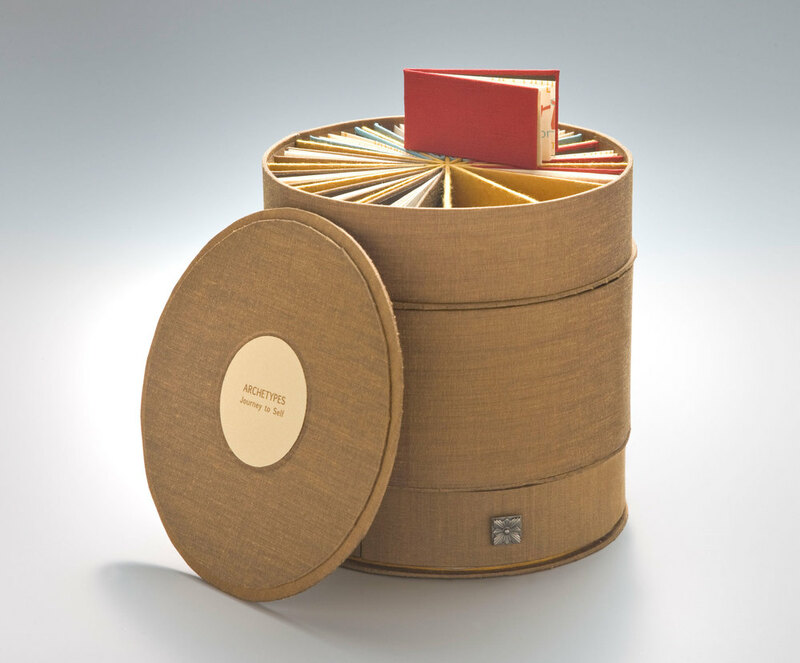 The final collection of miniature artist books is housed in a custom clamshell box. Proceeds from the edition benefit Pyramid Atlantic Art Center and CityDance Ensemble. Finding Grace (2010). Ballet slipper leather, handmade and found papers, pigment ink, tulle, waxed thread, pointe shoe ribbon. 6 x 9 x 2 inches closed. myTurningPointe (2009). 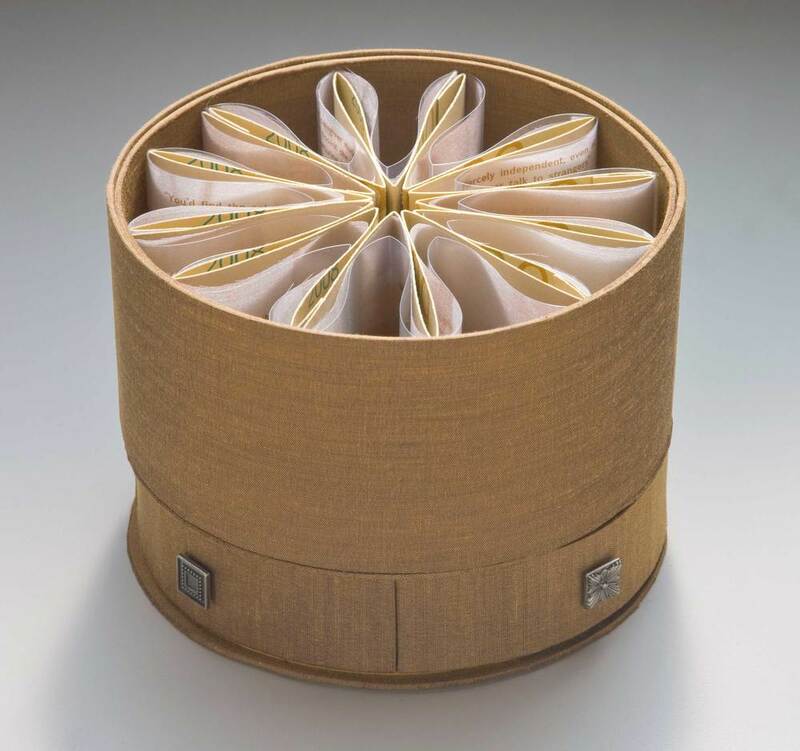 Accordion book that opens to a tutu. Handmade paper, pigment ink, tulle, thread, pointe shoe ribbon. Reflections on my time as a classical dancer and coming to terms with choices, regret and moving on. Love Letters from Germany (2013). Paper, hand- and machine-stitched, documenting four letters written about living in Germany. Pairings (2009). Boxed set of four books. Paste papers, block prints, thread, handmade paper, binder's board, book cloth, glue. Baby Blue (2010). Tunnel book. Book cloth, binder’s board, wheat paste, archival digital prints and Sharpie on fine art papers and mylar. 9 x 12 x 3 closed. Inspired by childhood photos retrieved from my parents’ basement, this piece is one of several where I explore things that have remained unspoken, secret or denied. I challenge myself – and by extension anyone who interacts with my work – to risk saying what we most deeply want to say, while respecting the need for privacy when it matters. The art and materials of the book are foundational to my work.